Stanleys leaving the factory were equipped with 35" x 4-1/2" tires mounted on artillery wheels (artillery wheels are wooden spoke wheels similar to what was used on artillery cannons). An option was Houk Wire Wheels for $100 additional cost. When I purchased the Model 735 it had 34" x 4" tires mounted on the wire wheels. 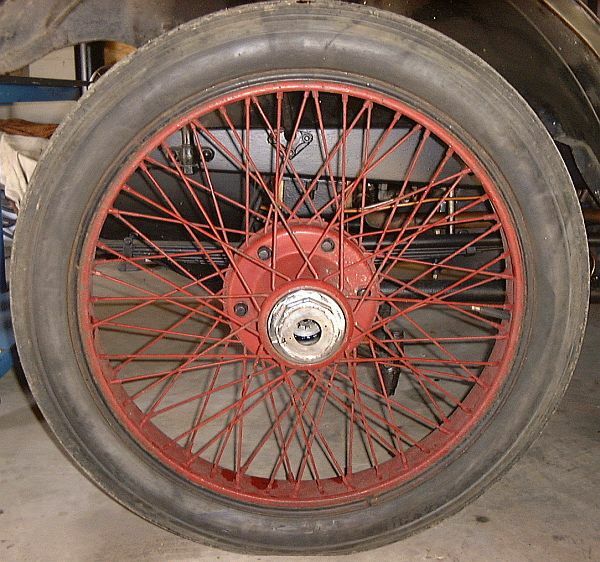 Houk Wire Wheels were advertised as "Quik-Change" and were manufactured in Buffalo, New York by Houk Manufacturing Company. Later the company became the Wire Wheel Manufacturing Company of America providing wire wheels for may of the budding automotive industry's luxury cars. Click on the following link to read an early Houk "Quik-Change" Wire Wheel Instruction Brochure. An investigation of the spokes on the wire wheels of my car revealed a number of them had been replaced sometime in the past with lighter diameter spokes than originally installed. In addition many of the spokes were loose and because the ferrules were rusted onto the spokes, tightening was impossible. The hub holes that lock the wheel to the axle hub for one wheel were ovaled from the wheel being run loose. All wheels were badly pitted and rusted from years of use. The tires were bald on two of the wheels and only had about a quarter of the tread left on the remaining two wheels. The spare was an original Firestone "Non-Skid" and both worn and dry-rotted. The restoration included removal of all existing spokes and ferrules. The drive holes in the wheel hubs were repaired so that they fit tight to the axle hub. General bodywork restoration techniques (sanding, body fillers, priming, etc) were performed on all wheel parts prior to new spokes being installed on each wheel. Wire wheel restoration was completed with painting in the new color scheme of the car along with a highlight pin stripe. New 36" x 5" tires with heavy duty tubes and flaps were installed on all wheels.